Discover the friendship and humor of the Nocturnals Brigade! 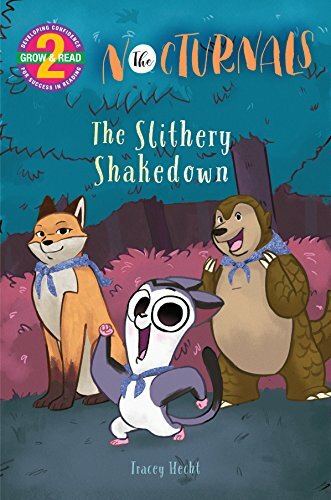 In The Slithery Shakedown, three unlikely friends—Tobin, a sweet pangolin, Bismark a loud-mouther sugar glider and Dawn, a serius fox—stand up to a big bully snake. In the process, they find themselves some spec-tac-u-lar snakeskin capes! I actually really like early readers for my two youngest children. They feel pretty special when I tell them that this is a book for them to review. It definitely didn't hurt that they both really liked the previous Nocturnals early readers (and their oldest sister enjoyed the novels). I'm happy that my 7 year old can read this to my 5 year old with no difficulty, but because it has chapters she feels like she is reading a book like her older brothers and sisters. My youngest really likes Bismark. She just thinks he is so funny, and I'll admit to having some fun with his accent when I read this to her. From an adult perspective there isn't much to this book in the way of story line, but like I said, my littles (to whom this is aimed at) really enjoyed it, and I found it happily sitting on their new bookshelf that has the honor of holding their favorite books. I absolutely love this series for my children. My 10-year-old son became enamored with the very first book and devours even these books that are geared towards younger readers. I'm happy that my 6-year-olds can now get to know the quirky and fun Tobin, Bismark and Dawn. The illustrations are well done and engaging and the story is just plain fun. Definitely a winner in this family. I thought the slithery shakedown was a good book. My favorite character is probably Dawn. The reason why is because she is very brave. I really like how they were lucky enough to have the snake shed its skin right there. that is why I like the slithery shakedown. Source: We received a copy from the publisher in exchange for an honest review.